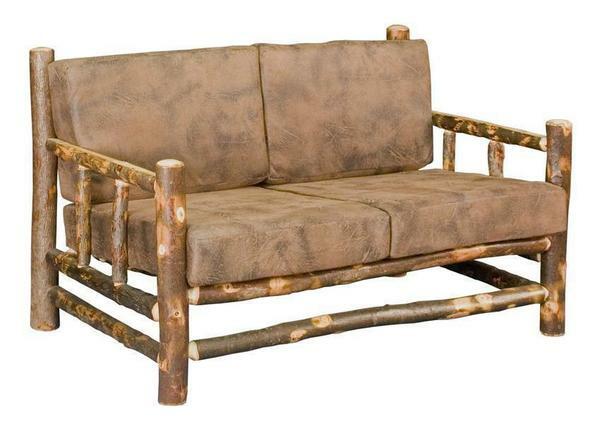 This country lodge love seat is skillfully handcrafted by talented Amish wood workers from rustic hickory logs and saplings giving the the love seat and the surrounding room a rustic outdoors look that will make you feel at one with nature. Choose either fabric or leather for the upholstery, as well as your choice in finish for the hickory wood frame. We also offer the option to have caster wheels added to the legs for easy transportation and convenience when rearranging your furniture. Contact one of our Amish furniture specialists today to receive finish, fabric or leather samples, or for custom ordering assistance on this Amish Rustic Hickory Love Seat. We also offer our Amish Rustic Lodge Lounge Chair, Sofa and Ottoman for a complete matching living room set.